Two of these posts in less than 1 month? I’m on a roll. Spring, I love everything about you. 1. Desert Essence Body Wash. This is my new favourite body wash – well, I can’t decide between the Vanilla Chai and Almond scents because they are both delightful. The lather is quite foamy too which is a big plus for me. It’s 100% vegan, cruelty-free and free of parabens, SLS, phthalates, artificial fragrances or colors, silicones, EDTA, glycol, or petroleum-based ingredients. Bravo, Desert Essence. 2. Frozen Chickpeas. Lately, I’ve been looking for alternatives to canned goods and I came across this line of frozen legumes and vegetables from Stahl Bush Island Farms. Cooking from scratch is always the cheaper option, but let’s face it; sometimes we need something ready in a flash. I just thaw the bag in the fridge overnight and they are ready to be added into dishes or made into hummus. This company has a variety of frozen products from butternut squash to lentils as well. 3. 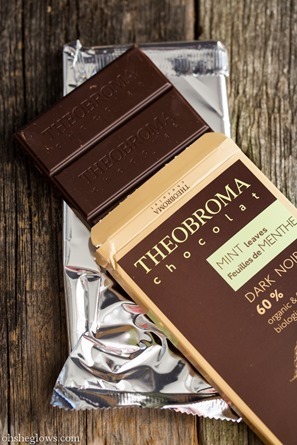 Theobroma Chocolat – Mint Leaves. This is a new-to-me chocolate and I’m hooked. Some days I have to hide it from myself which works for about 3 minutes. If you are a chocolate + mint fan, you will love this bar. PS- Don’t you love when one square of chocolate is double the size of normal squares? I’m betting a woman designed this bar. 4. Strawberries. Topped with Coconut Whipped Cream for dessert. I’m also playing around with a strawberry vanilla and strawberry orange chia seed jam recipe. Yum, yum, yum. 5. Gabriel Mascara. When I had a nasty skin reaction earlier this year, I really had to overhaul the chemical-laden products I was putting on my skin each day. Luckily, there are so many choices out there these days, but it can be overwhelming trying to navigate it all. Gabriel Cosmetics is a line of vegan and gluten-free cosmetics using 100% natural ingredients that are fragrance-free. This mascara is what I would call a basic, no frills mascara. It gives a very natural, light feel without being heavy or overdone – perfect for what I’m looking for in my normal life. It almost looks like an eyelash stain and while it lengthens, it does not build much volume. I can get a tiny bit of smudging here and there, but it’s minimal and I haven’t noticed any flaking yet. I might explore other natural mascara brands in the future (have any to recommend? ), but I can see myself coming back to this one for sure. 6. Sephora Eyelash Curler. I love this pretty curler! It gives a great curl that lasts all day and it comes in a wide range of fun colours. I love seeing the pop of colour in my make-up bag…never gets old. 7. PLAYOFF HOCKEY! Ahhhhh. I’m a hockey girl through and through thanks to growing up with a fanatical hockey fan for a father. It’s in my blood. Can I just say how happy I am to see the Leafs in the playoffs after nine painfully long years? The last time we watched the Leafs in the playoffs was during undergraduate university times. Crazy. I just can’t get enough of the playoffs this year and I’m following as many different series as I can find on TV. Oh, the drama that’s going on! It’s intense. I don’t know how these guys do it. The only thing better would be to score some tickets to see a playoff game in person, but sadly I don’t see that happening any time soon unless I can bribe someone with a home cooked vegan meal. Other things on TV I can’t get enough of are: The Mindy Project and Chicago Fire, but I think the season is winding down quickly. 8. Lightened Up Summer Granola. I’ve been on a big Vegan Overnight Oat kick lately and I love topping it with my favourite light summer granola. Nothing like a 2-minute breakfast. Other things I’m loving lately? Neon clothing of any kind (I’m an 80’s child, what can I say? ), wearing a t-shirt and shorts outdoors for the first time in months, and baby geese (goslings) by the water. That’s a wrap. Hope your week is off to a great start! Ramblings + A Trio of Cookbooks Giveaway Winner! 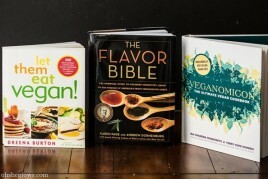 A Trio of Cookbooks Giveaway! New to your blog and love it! Go Leafs Go!!!! That sounds lovely – glad it was helpful! I always have a bottle of Desert Essence Hand Lotion in my purse, I love the Almond scent! Theobroma chocolate I haven’t seen anywhere around here in NC. Hmmmm…. I am a huge fan! I love to cook and have enjoyed many of your creations in my own kitchen. Thanks for sharing. Your cookbook will be incredible! I will have to check out that mascara!! Thanks for the reminder about vegan and gluten free skin care products…….it can be so easy to just focus on making what we eat be clean and healthy and totally forgetting to consider what’s in the products we apply daily! Eek…at least for me it is haha :) Thanks for the great post!! Love these posts..always inspires me to add 8 new things on my “must-try” list! 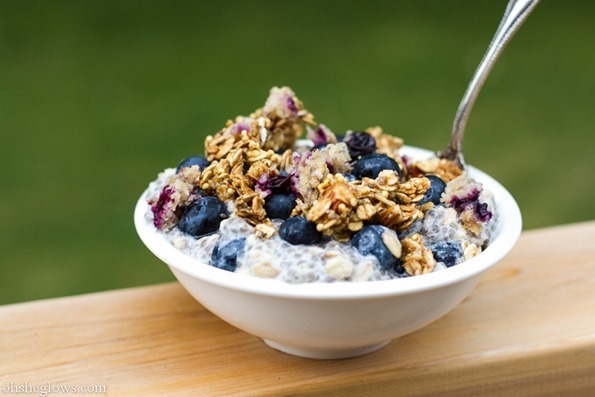 I love thickening my oatmeal with chia..the strawberry chia jams would be an amazing addition, can’t wait for that post! Yea!! I am glad you are finding some products that work for you. I haven’t tried the Dessert Essence body washes, but the hand cream is amazing. I was just looking at that eyelash curler, too! I’m probably going to try Tarte Lights, Camera, Lashes next, http://tartecosmetics.com/tarte-item-lights-camera-lashes-mascara, but I can’t vouch for it as of yet. I, too, saw goslings this weekend! I couldn’t remember if they were called that or not, so I kept calling them Ryan Goslings. Thanks for sharing what you’re loving! These posts always make me happy. I came across green garbanzos in the frozen section yesterday but wasn’t sure if that’s genetically engineered or are green garbanzos a real type of bean.. anyone happen to know? I never knew they existed until now – just googled them! Crazy stuff. Maybe try emailing the brand and asking how they are produced? I’m going to have to try that chocolate. I love anything with mint and that chocolate sounds amazing. I love the series of things you’re loving. 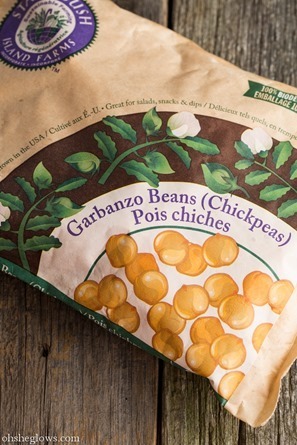 That’s great to hear about frozen chickpeas- I usually buy canned because dried are such a pain in the a$$ but frozen sounds like an even better alternative! 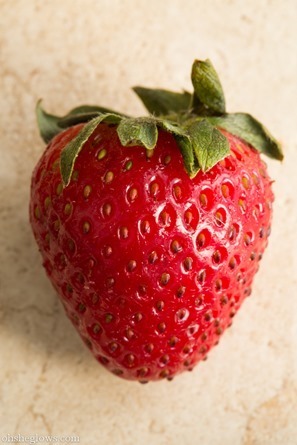 And I agree on the strawberries- I bought a 10 pound container of them over the weekend….so excited to just snack on them non-stop over the next few days. Since you asked, Ava Anderson’s mascara is simply the best natural item I have tried. Simple and long lasting, free of all the chemical no-no’s. It does add bulk, doesn’t smear, and can top off both a simple look and an evening out look. Ava prides herself on providing a full line of toxin free products, and they are all amazing. I have been a consultant for some time and just love it. I’m happy to answer any questions. Check it out! Thanks for the tip, I’ll have to check it out sometime! I adore the Desert Essence brand… I use the raspberry shampoo and conditioner, and it keeps my dry, curly, red hair from being horribly unmanageable. I use “100% Pure” mascara, which I love. It’s fruit and flower based, all natural. It even smells sweet! It lengthens and darkens my lashes, but is not waterproof! Geeze, I’m surrounded by Leafs, Sens, and Oilers fans up here. I stand solo in my celebration for the Pens and Canuks!! I’ve heard great things about that brand too. I’ll have to check it out. I have a soft spot for the pens too…yesterday’s game was pretty exciting! I love 100% Pure’s mascara! I use the Blackberry color, it’s a dark purple that’s softer than black. It never flakes or smudges (even through hot yoga!)! Love this post, always nice to get inspired by new ideas! I actually run my own home based business and am an Independent Consultant for a line of beauty and health products that are Vegan, cruelty free and free of harmful ingredients. If you want more information feel free to drop me a line! I love BareMinerals Flawless Definition Mascara – they says it’s 100% all natural (I may have to look into it further), but it is incredible. The brush is small and easy to use and it adds volume without looking like you have a lot of makeup on. I love it and will never try anything else! Great post! I def want to try the Desert Essence products. They sound great! Also, that chocolate…yummy! Need to give that a try too! I really dig Desert Essence products! They all smell so good! Everything by 100% Pure is amazing – cosmetics, skin care, hair care, all of it. 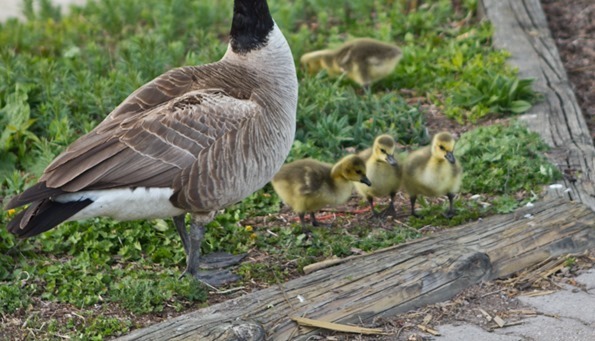 Seriously…those goslings? I just died a little bit from the cuteness. I am LOVING the playoffs this year as well. It just feels like after the lockout, everyone is excited for hockey now! As a Pittsburgher, I’m a Pens fan no matter what, but all these games lately have been so exciting!!! Ooh I’m going to have to grab some of those frozen legumes. I like having cans on hand for when I’m low on groceries, but stocking my freezer with those would be a better option! I have the Sephora eyelash curler in pink. I love it! I’ve never even seen frozen garbanzo beans before. I always buy them canned (BPA free). I usually use garbanzos in a salad, or I roast them with vegetables. Do they defrost quickly? And is there a texture difference? I’m intrigued now! Fellow die-hard hockey fan here (Let’s go Pens!). Wow, I didn’t realize the Leafs haven’t clinched a playoff spot for that long. I can just feel your excitement! Seems like most of the teams really amped up their play this season since it was so short. I’ve seen a lot of incredible games. Neon clothing…well I just got a pair of running shoes that are shocking neon green. They were out of my size in any other color and so neon it was. Let’s just say you’ll always be able to find me in the dark in those. Love all the links and the goodies and what you’re loving. Always fun to see what things people love! I’ve looked and looked for natural lip glosses lately and haven’t found anything quite yet. Most of them have artificial dyes. That’s why I’ve been using the beet juice + vitamin e oil trick. Works well for now, but I’d like to find something else! If anyone else knows of any, feel free to give it a shout out. p.s. I’ve been following your blog for quite a long time now and you continue to inspire my vegan diet. I’m so excited for the release of your cookbook! I don’t know if you’ve tried it already, but Aveda Mosscara is vegan and I find that it works pretty well. It’s not waterproof, but even if you’re caught in the rain or you workout (and sweat), it won’t smudge unless you touch it. Hi Julie, I wasn’t aware of that mascara! I’ll have to scope it out next time I’m at the mall. Looking forward to the strawberry vanilla chia seed jam recipe! Hi Angela! Where do you buy the desert essence products? I’m hoping I can find them somewhere in Vancouver! Hi Lindsay, I’ve been buying them from Organic Garage which is a discounted organic grocery store here in Oakville. I think I’ve also seen them in Fortinos (natural food/health section). Maybe their website has a list of vendors? If you don’t have luck with your local stores and you’re okay with online purchasing, well.ca has Desert Essence products as well. I’ve purchased from them before and it was very easy, plus shipping is free if your order is more than $25. I just love every single thing about this post, including HOCKEY! I’m a Blackhawks fan so I’m hoping our season will continue. I never thought I would be a hockey fan but my boyfriend converted me : ) I don’t know how those guys do it either, so much drama! Great list! Yesss for strawberries. I’d also add the extra hours of daylight we’re getting! One question: I’ve read, and re-read, your tutorial for making whipped coconut cream. I have tried it twice and failed. I mean, it’s thick…but it comes out of the can that way. No amount of whipping (5+ minutes with an electric mixer) seems to make it get all light and fluffy the way regular cream whips. Is this normal? It’s still delicious, but it doesn’t have the same body. I’d appreciate any tips anyone could give me! A bunch of people have had this problem and I think the consistency can vary A LOT by brand from what it seems like. I use Native Forest full-fat – it also has added guar gum which might help with the consistency. What brand did you try? I agree with you on the chocolate squares – those are my kind of size squares! As for the Stahl Bush Farms – LOVE their frozen organic berries for smoothies and their butternut squash, as that is one thing I am always way too lazy to buy and chop up myself! Thanks for reminding me about your lightened up granola recipe. I’ve been relying on smoothies for breakfast now the weather has warmed up but wouldn’t mind something a bit heartier! I really like the afterglow cosmetics mascara. Totally natural, gluten free, etc. and it works every bit as good as “regular” mascara. I love everything in this post! The Stahlbush Farms products are fantastic, and I’m a big fan of theirs as well. The frozen chicpeas (as well as the black beans and rice) are super convenient, and I’m always amazed by how easy they are to use. I am in love with 100% Pure EVERYTHING and think you should try their mascaras! They have no icky, weird ingredients and they smell faintly of berries. They make my eyelashes full and long! I have been using their mascaras for years and have no plans of changing. 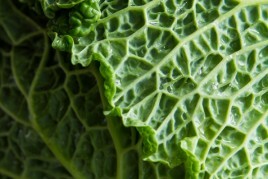 Just discovered your site whilst looking for a recipe for raw broccoli salad. Detox salad it is. Thank you! Dr. Haushka mascara is the best I have ever used. Natural ingredients (smells like roses), never clumps, non- irritating and makes my lashes look fabulous. I try others and always go back. Yesyesyes GO LEAFS GO!! Lived my whole life in Toronto/GTA sooo it’s preetty exciting :) Also loved The Mindy Project this year, it’s hilarious! I’m obsessing over chickpeas, strawberries and hockey as well. I never knew frozen chickpeas were available so thank you for that!!! But unfortunately I’m coming out for my team, the Habs. We can still be friends, though, right?? :) Have a great day! Well, my dad and sis (+ brother in law) are devout Habs fans, so I’m willing to let it slide. hah ;) Even though I cheer for the Leafs, I still like to root for my fav Canadian players! Hi Erin, Thanks for the link! I’m loving the list and will print it off to keep handy. I find it so hard to keep track of all the various brands! I loooove these posts! As for skincare, I had one at home which isn’t strictly vegan (it has beeswax) but it is still natural and it’s the best natural mascara I’ve tried so far. No clumping etc. and it gives more volume and length than I had expected. It also doesn’t smear or anything which happens to me very often. However I’m not sure if it’s available in Canada: Annemarie Börlind’s “Long Lasting Volume Mascara”. When it’s empty, I’ll have to watch out for a new one which IS vegan because it don’t want to use bee products anymore, so thanks for the great tip! Mascaras I sadly can’t recommend are those from Lavera. They give me panda eyes within 1 hour. Thanks :) I still have no clue what caused the skin issues! The problem is, I changed so many things in my diet and with my skin products (plus, we switched to natural cleaners/detergents!) it could be one of many things. I don’t know if I will ever know. I still haven’t re-introduced soy and gluten yet and a couple other suspected foods, but will have to at some point! I was also going through a stressful time so it could be stress related too. Oh the body is a mystery isn’t it? At the risk of answering a rhetorical question: Oh yes it is! I had a LOT of stress recently with school and final exams and things that I suddenly wasn’t able to breathe properly anymore. That was scary! When inhaling, my breath just suddenly stopped before my lungs were filled and I couldn’t do anything against it. But since those exams are almost over now and I started doing Yoga, it’s slowly getting better again. However, good luck for your search for clues! ;) I recently cut out wheat (only wheat, not gluten) and that makes me feel way better, too. I’m a hockey girl too! I literally just bought the Vanilla Chai scent from Marshall’s at a discounted price! I was super excited to see that it was vegan and couldn’t resist. I was so surprised when I saw it on your blog – which I am addicted to by the way, thank you! – and now I can’t wait to try it even more! I recently bought mascara and a lip/cheek stain from the 100% Pure line and I like them. They brand is fairly inexpensive. It’s all natural and uses fruit pigments for color. The physicians formula organic line is good too. I’ve used the mascara and eyeliner. Honeybee gardens is another natural brand, I haven’t tried their stuff but it’s pretty cheap! I would also recommend swansonvitamins.com. They have natural cosmetics, face creams, hair products, etc. I recently bought face cream and witch hazel toner from them and I like both a lot so far. They have a ton of great products and really good prices. Woo lost post! I’ve been getting into more natural products lately so I just thought I’d share :) Hope this helps! I love the Desert Essence sweet almond scent! The body lotion smells so good that I almost want to eat it — and I probably could with all those great ingredients! 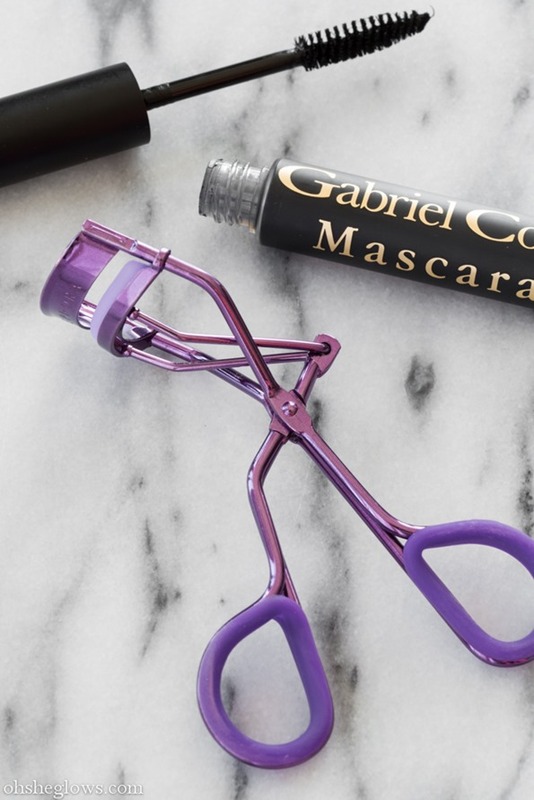 I’m also loving Gabriel cosmetics lately, though I’m not big into mascara. I might give it try, though. Thanks! When I cook beans, I make a huge, HUGE(!) pot of them and then I freeze them in batches in their cooking liquid. It’s so easy to just pull a tub out of the freezer the night before I need it. And very cheap! I made the potato black bean nacho plate yesterday…oh my! My family (esp my dad) gobbled it up. Thanks for the make up tip – please keep sharing! I love the baby geese- so cute and fuzzy. If you are looking for other beauty/body products, I love Soapwalla’s deodorant and face serum. I am amazed how well the deodorant works and the face serum has really helped reduce the redness in my face. I’m going to try their soaps next as they look great. I use a lot of Origins makeup and really like that line. What was the cause of the skin reaction on your face? I am dealing with a similar issue. Awesome, thanks for sharing Hannah! I just found your blog via the Vida Vegan feed – and it’s been a while since I bought it but I love the Dessert Essence vanilla moisturizer. I’d forgotten all about the brand. Glad you found my blog! I’ve found quite a few through that feed too. So glad they put it together :) Hope to see you at the VVC! Ive been using one of Desert Essence’s moisturizers and I’m really happy with it so far. 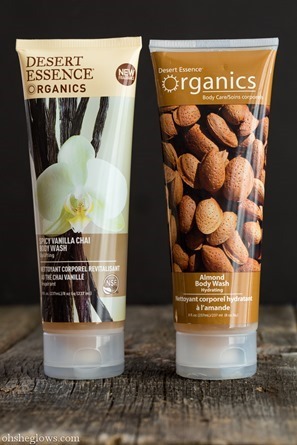 Cruelty-free and free of parabens body wash? Yes, please! I am loving everything Spring too! I am on a mission now to find that chocolate bar – you can”t go wrong with the combo of chocolate and mint. Where did you find it? We LOVE our hockey too and our local pro team (AHL) is in the 2nd round of the playoffs now – yippee!! Sorry, but we are rooting for the Red Wings, but still it’s nice to meet other hockey buffs :). Chickpeas (and other yummies) from the freezer (I will def. be checking out Stahl Bush Island Farms) AND Vegan Whipped cream! OH, you’ve made MY day! Love list like this! Happy Spring Time! It has arrived to Amsterdam as well and we are beyond happy! Thanks for the great post, Angela! I’m in the market for an organic moisturizer, have you tried any by Desert Essence? I’ve just started using the Desert Essence fragrance-free moisturizer (in a blue tube) and I like it so far!! My husband doesn’t like the scent (which in reality is no added scent), but I find it works nicely and I like that it doesn’t have added perfumes because they can really bother me. Lovely pics in your spring post by the way! jane iredale make up – i swear by it and i am currently obsessed with the mystikol pens and sets they have!!! also bare minerals and arbonne (they have a sea aloe gel in there sea detox for sun burns etc that is simply a miracle worker!!). I loved your blog, kept exploring it after this story! Could you please print all the recipes used for your Mom-in-law Thanksgiving (the ones on the plate photos). I printed off the VOO recipes, look forward to making all of them sometime. Will be trying the Green Monster recipe first, want a shake/smoothie for breakfast options. I hope I’ve also signed up for your blog while I was at it. I am an O/L Veg. but I do Vegan also for friends w/allergies, health issues, etc. and like the ideas. I have been inactive for 2 yrs. now, (back in school part-time to complete degrees, working fulltime), I want to get back to being active and feeling healthier too and reading both blogs and getting meal/physical activity ideas helped. Sorry for the delay in getting back to your comment – I’ve had a bit of a crazy week! Thanks for your kind words, I’m so glad you enjoy the blog :) Just curious what do you mean about printing the recipes off? Not all the photos identified what you all were eating that year. Something that looked like a “hushpuppy” may have been bread? 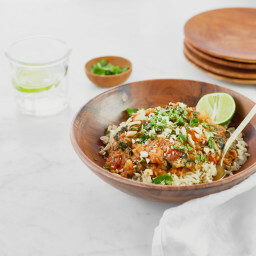 I tried to match up what food was in the photos as best I can with the available recipes, which I also printed off the computer (that’s what I meant) and I’d actually like the recipes to everything on the whole plate, the photos just blew me away. Nice to see spring is putting a “spring” into your step. At some point when you have a little bit of time, I’d love to hear how you’ve managed keep up with some sense of normal as you hit the final phases with the cookbook project. I am going through a pretty intense and non-stop work/stress period – on the job, at home, extended family, etc., etc. I have found it very difficult to maintain regular exercise and eating, and just to keep smiling in general. Forgive me if I have not read all 93 comments above; you blog must be a full time job! I was amused by the frozen chickpeas. I used to soak and cook all my dried beans and legumes. Then I got lazy and started buying canned. One day I cooked my own garbanzos again and was amazed at how much better they tasted. Now I cook them in large batches, rinse and freeze them in the correct portions for a batch of hummus or to toss into a salad. Cheaper, too. Keep up the good work, Angela! You are an inspiration. Cheers, V.
Not sure if this has already been asked in the comments… but what gorcery store did you find the frozen legumes line at? Excited for this! Please forgive me while I say, Let’s Go Islanders! I still recall the playoff series against the Leafs in 2002. 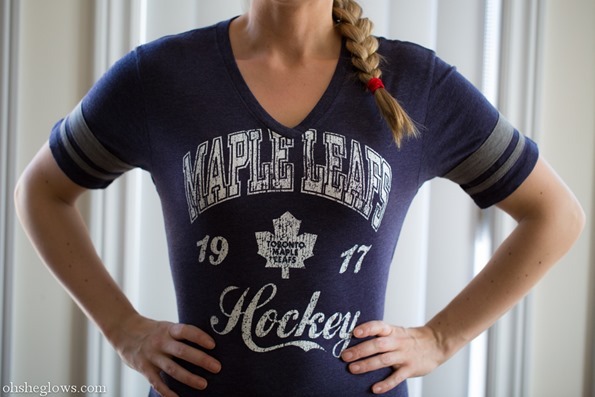 I grew up a huge hockey fan and I am so glad my son is now one as well…I switched over my cosmetics as well due to the chemicals and irritations/allergies. I have been using Clinique eye products since I switched from Dior and so far so good.I read about Gabriel and have considered trying it. I recently got Dessert Essence shampoo and conditioner and LOVE LOVE LOVE IT. Best things ever! So so happy with them. Made me excited to see you speaking well of them as well! I didn’t know there were frozen garbanzo beans! I’m getting these on my next trip to Whole Foods! first i was into new girl, and would just keep the tv on while the mindy project played afterwards. but now i am totally obsessed with the mindy project!! tuesdays are my favorite day :) and i havent watched tv in the past few years at all hardly. I also love this post! Where did you get the chocolate bar??? 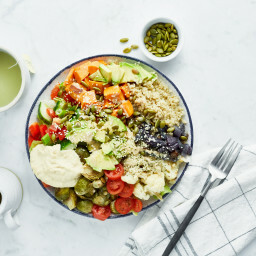 Hi Stephanie, It’s from Organic Garage – a discounted organic grocer in Oakville. If you can find an Aveda salon, their Mosscara is my absolute favourite mascara! It’s all natural (as all Aveda products are), and contains Icelandic moss so your eyelashes are being conditioned while you wear it. It also makes your lashes look great, and is pretty water resistant, though not waterproof. I always read your blog, but I never post! I really look forward to your posts about what you’re currently loving! Hi Leia, I too have tried a TON of natural deodorants with great disappointment! The only one that I could say I would buy again is called The Healthy Deodorant by Lavanilla (the ingredients are so clean!). The only downside is that it’s very pricey! I ordered it from Sephora. I haven’t tried any Desert Essence ones yet I don’t think. Let me know if you do! I’ve been really happy with Earth Lab’s Raw Mascara. After disappointing smudging with other brands, because I can’t seem to remember not to rub my eyes, this one is doable for me. It will still smudge, but seems to require moisture and rubbing to achieve that look. Beauty Without Cruelty has a wonderful waterproof mascara in brown that’s perfect for an everyday look and actually holds up! I love chickpeas and they’re so versatile. I often include them in a nice spicy curry over fragrant thai rice. That granola for breakfast looks so healthy and delicious! Facts, by any chance for these cookies. 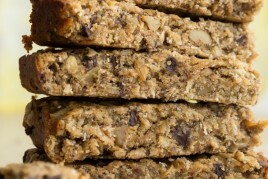 I made the Banana Protein Bars, and noticed the NF there. Also, I subbed buckwheat groats for buckwheat flour. They are alright, but wanted to ask you if that was an option you would have considered. Thanks so much for your terrific blog, and congratulations on all of your rewards. Well deserved!!! I’ve been using Elf brand mineral mascara – its inexpensive, vegan, and I really like the brush. I dont really know how natural their products are though. 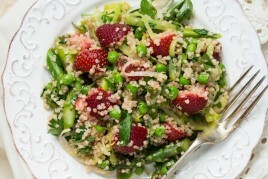 Whole Foods also carries frozen brown rice and quinoa that is fantastic! Great when I don’t have a lot of time for meal preparation. I love your recipes! I also love the things your loving series. Will definitely be getting me some of Desert Essence. Would you mind sharing what bathroom cleaning product(s) and laundry detergent you prefer or have had any success with? Looking forward to your cookbook Angela! Hi Milena, So sorry about the delay in reply! I kept forgetting to go check out the brand of my cleaner :) For laundry, I use soap nuts. I’m fairly pleased with the results so far, although I don’t find they work as well on stained clothing. For all-purpose cleaner, I’m currently using Nature Clean multi surface cleaner. I love it because it barely has ANY scent (normal cleaners drive me nuts), however I wouldn’t say it cuts grease as well as others. It’s an ever-evolving hunt! :) Let me know if you have any to recommend. Take care! Hello, I have also been trying to combat a bad skin problem since last June, which began after I stopped taking birth control pills. I have since started eating vegan about 2 months ago and I have seen improvements, but the problem isn’t 100% defeated yet. How did you heal your skin? Thank you so much in advance! I bought the Desert Essence shampoo and conditioner this weekend, LOVE IT!!! a girl at my work commented that my hair looked really healthy and shiny. How great is that! Thank you for the recommendation! I used to buy the frozen wheatberries by that brand to use in cold salads!!! I should try their chickpeas too!!! And I need to get a god vegan mascara. I still just buy whatever’s on sale and I don’t want to do that any longer!!! I’m totally going to check out yours above! If you like the Dessert Essence body wash, you should try their lotion. I recently discovered it at my local co-op and it is by far the best lotion I have ever used. Almond and Lavender scents are both great! It is non-greasy but rich enough to keep you moisturized for quite some time. The Vanilla Chai lotion is stashed everywhere! In the car, at the office, in my bag! Love it! 00%Pure sound like they are a must try too! Oh and neon clothing…try Warehouse One the Jean Store (not just jeans). I walked in and what a fabulous pop of gorgeous neons for spring/summer. You’ll love it. Previous post: Ramblings + A Trio of Cookbooks Giveaway Winner!